This fifth installment of the Discover a Guitarist series is a guest post from George Pepper of A Monk’s Musical Musings. First of all I’d like to thank Joe for this invitation, as I consider it quite an honor. When you’ve been around the guitar scene as long as I have – over 35 years now – you’re bound to have discovered many guitarists who have influenced you. This is certainly true for me, as I count Jimi Hendrix, Eric Clapton, and Jimmy Page among early influences; John Mclaughlin, Al DiMeola and Larry Carlton later on; and then Julian Bream, Pepe Romero and Christopher Parkening in the classical field. This is not a complete list, by any means, but it should give you an idea of how broad my interests are. Nothing, however, could have prepared me for the phenomenon that is Kazuhito Yamashita. The year was 1988, I had switched from steel to nylon string guitars, quit my last rock band, and had returned to school for a master’s degree in traditional composition, with a minor in guitar performance. I knew I didn’t want to be a traditional Segovia School player, but the classical guitar world was so conservative that there weren’t any compelling alternatives that I was aware of. Then one day I was shopping for some music and I came across a CD by this diminutive Japanese guy who had recorded his transcription of Dvorak’s From the New World Symphony… on solo guitar. The idea was so preposterous that I believe I may have laughed out loud, but I had to hear it, so I bought it. Listening to that CD was like being hit in the face with a baseball bat. My entire guitar reality was shattered to shards, and it really took me a few days to compose myself. What I was hearing seemed to be physically impossible. Not just parts of it, ALMOST ALL OF IT. I quickly learned two things: Kazuhito Yamashita was notorious – infamous? 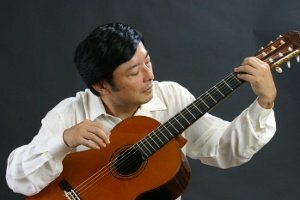 – for inventing new techniques on the guitar, and the traditional classical guitarists detested him (I suppose because his virtuosity redefined what a classical guitar could do; Paganini and Liszt were derided in their day too). Other “impossible” transcriptions Yamashita did back in the day included Mussogsky’s Pictures at an Exhibition and Stravinsky’s Firebird Suite. Probably needless to say, I got them all. As luck would have it, Kazuhito Yamashita was scheduled to appear at the 1989 Guitar Foundation of America convention in Lubbock, Texas, just a couple of hours drive from Texas State University where I was matriculating. So, I got to see him perform the Dvorak transcription live. I thought the recording wiped me out, but actually seeing him perform the piece up close was just killing. One of his techniques was the single-finger tremolo: That is, using the index finger of the right hand to do a tremolo with attacks on both the contraction and extension strokes, while simultaneously playing a bass line with the thumb and a melody with the middle and ring fingers. That should be physically impossible, and it is for most I guess, but I watched him do it. Unfortunately, there are no videos of Yamashita playing the Dvorak online, but there are some vintage clips of him performing the Mussorgsky. For more info, see YouTube and Wikipedia. Now, being able to develop technique to that level is just not something everybody can do – a lot depends on being lucky enough to have the right genetics (Which I don’t) – so it was more as a composer that he influenced me, really, as his techniques opened up my conception of guitar music into a whole new universe. But it was also more than that: His attitude was influential too, as I pretty much left the stuffy world of classical guitar behind after being exposed to him and went off entirely in my own direction. Already a fan? Leave a comment below and tell us how you discovered Yamashita’s playing and what it’s done to you. 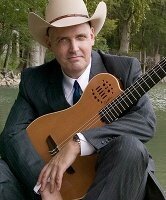 George Pepper – BM Berklee, MM Texas State – blogs as Hucbald at A Monk’s Musical Musings, performs as a solo guitarist around the southwest, and is working on an album called Heavy Nylon.